When I saw the name of Kelly Ramsey's food business—Art Eatables—right at the entrance to the 2012 Incredible Food Show, I knew I would like whatever I found in her booth. Until two weeks ago, Kelly worked full time. In addition, after hours, she made hand-painted chocolates and distinctive "small batch" Bourbon-flavored truffles, each showcasing a different fine Kentucky Bourbon. Honestly, truthfully, I do not love either chocolate or Bourbon (I know, I know—blame it on bad home training.) What drew me to Kelly's booth was Kelly herself, smiling like sunshine and radiating happiness about having become a full time chocolatier two weeks ago. Kelly's presence, and her ability to move from the corporate world to a highly skilled form of foodcraft for her livelihood, promised new adventures in Kentucky food at this year's Show. The Show delivered on that promise. Not that I got to see all the wonders of the expanded, packed-to-the-rafters 2012 Show. I had a few welcome tasks during the day, including the "Sorghum Sermon," a workshop I delivered with Randal Rock of County Rock Sorghum. Picture a 4-H cooking demonstration cross-bred with a PowerPoint sales pitch on the wonders of sorghum for humans, farms, and communities. An audience member, Abigai, age 4, kindly helped make one key point: sorghum is one way to turn children into cooks at an early age. 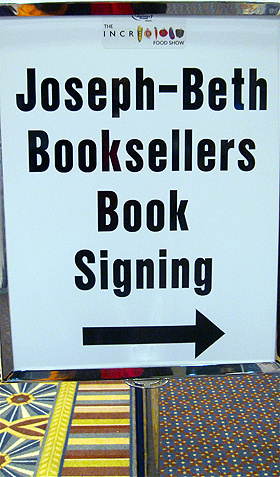 Joseph-Beth presented a big cooking-friendly bookstore, supporting Kentucky authors by hosting hourly book signings. Signing Sweet, Sweet Sorghum: Kentucky's Golden Wonder proved even more fun than expected when visitors began arriving while I was still setting up: family members, fellow Kentucky food bloggers, Kentucky Department of Agriculture officials, including Kentucky Commissioner of Agriculture James Comer and key KDA official Kristen Branscum, favorite chef and Kentucky food visionary Ouita Michel, and lots of friends. I even sold some books! No official word, but it seemed as if attendance grew by several thousand people for this fourth Incredible Food Show. I had access to the Sullivan University Cooking Stage at one point, and from that elevation, the vast Convention Center hall looked packed in all directions. My photographic attempt to show you the crowd primarily shows, instead, my readiness for some photography classes and the next level of photography equipment, but if you squint hard, the photo above hints at what I could see. Offerings at the Sullivan Stage get better each year. This year's menu of presentations, from whole hog butchery to Food Ways of Kentucky, could have kept me in the the front row for the entire day, if I had not had other happy duties. First time Restaurant Row vendor Midway School Bakery featured appealing stacks of butter-and-goodness-based cookies, pies, and doughnuts, and then iced the cake with preview gift boxes of holiday cookies. Gorgeous boxes. 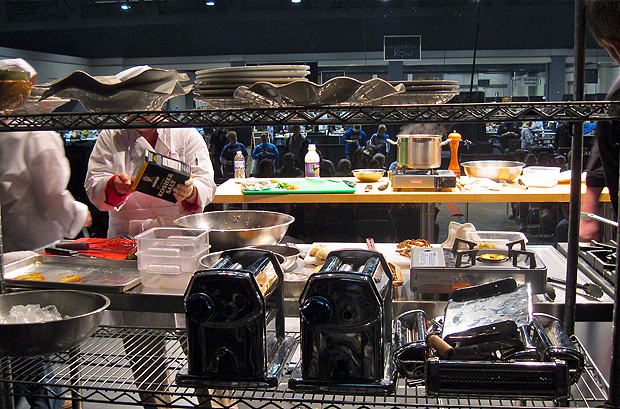 Best seat in the vastness of the Lexington Convention Center and Rupp Arena at around 1:45 PM had to be at the judges' table below the Sullivan University Cooking Stage during the Pro-AM Competition. Four teams, each including a pro chef and an amateur, competed to scope out ingredients and equipment on the Cooking Stage and then invent, prepare, and serve a dish to four lucky judges. While hundreds of people watched. While professional videographers documented every dropped onion shred. While a clock ticked down. If I knew the secret of how I got to be at that judges' table, I would surely share it, because you should have this experience, too. Savoring Kentucky got lucky. One good personal palate-improvement result: two of the four dishes featured sautéed Swiss chard that I could have eaten for days. I want to like Swiss chard, for all the health and availability reasons, but my own experiments with it have amounted to "taking my medicine." Chef Alex Jenkins of Good Foods Café, a fellow judge (see why I felt like an impostor? ), assured me both chard preparations could be reproduced faithfully at home with olive oil, garlic, salt, pepper and freshly washed chard. 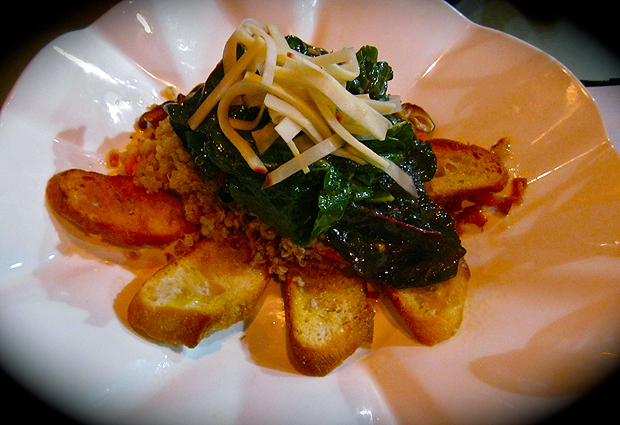 I intend to re-ignite my Swiss chard experiments. Country Rock partners Curtis Congleton and Randal Rock and their families brought sweet sorghum syrup to the IFS for the first time, and did it with verve. Outside the Lexington Convention Center, in a biting wind, right on Main Street, Curtis and Randal cooked freshly pressed sorghum cane juice down to make the delicious, healthy, amber syrup Kentuckians hold appropriately dear. Inside, Randal took time to help with my sorghum workshop, outlining the basics of sorghum planting, cultivation, milling, and cooking. Meanwhile...all day long, actually, Congletons and Rocks explained sorghum, served up sorghum samples, and sold sorghum at a booth in Aisle 200. Sorghum definitely showed up at IFS this year, thanks to Country Rock. Given the richness and scope of the 2012 Incredible Food Show, I could have had two dozen completely different paths through this day, or 200. I missed celebrity chef Tyler Florence completely. I failed to taste or visit at least 70 percent of the booths in the Marketplace. I used the wine area only as a passage way, never stopping to taste. I never got to the Quick Tips booth. I saw no seminars or workshops other than my own. I visited only one of the new Restaurant Row establishments. I barely glanced at handsome handmade cutting boards, tableware, knives, and other kitchen essentials. What an experience of abundance, creating perfect happiness for a bonafide (but, ahem, mature) High Sensation Seeker. The team behind the Incredible Food Show, including Show Manager Theresa Lloyd and Lexington Center Marketing Director Sheila Kenny, along with primary sponsor Kentucky Proud, grow and improve the Show each year. Congratulations to them for a huge step forward in 2012. 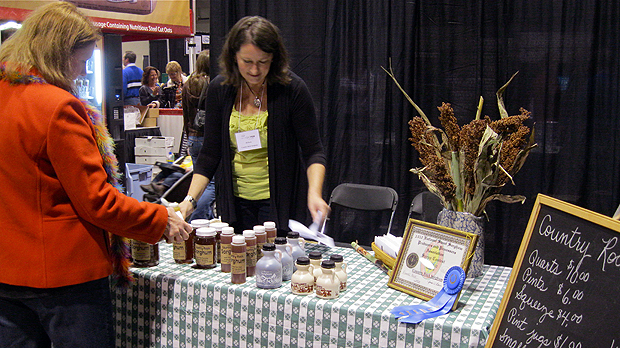 In addition to increasing the scope, size, and variety the Show offers, the organizers set up the Marketplace this year in such a way that virtually every booth occupied a valuable, two-sided corner. Exhibitors appreciated this attention to their interests, and I did, too. Finally, Savoring Kentucky particularly appreciates the deepening commitment to true Kentucky food evident both in the Show's offerings and in the growing audience for the Show. The Traditional Foodcraft section, new this year, featured sorghum making, cider pressing, and apple butter making, all carried out in less than ideal weather conditions and away from the main exhibit space. Even so, the vendors reported, people came out in the cold to see and talk with them. Very good for year 1! Photo Credit: Second Photo (Rona with Abigail): Jill Rock. Thank you! Sponsorship: Midway School Bakery and other restaurants owned by Ouita Michel, and the Incredible Food Show are Savoring Kentucky sponsors.